The New Gen PSS Conference 2017, by T2RL and FlightGlobal, is coming to QEII Centre in London from 10th to 12th of October. The Passenger Service Systems (airline reservations) market is undergoing some major change at the moment: Amadeus and Navitaire continue their rapid growth, having reached a combined 43% market share (by passenger boarded). Sabre and Travelsky (China) book 17% and 13% respectively (see note 1). Most of the remaining traditional PSS vendors are in sharp decline, fewer airlines are opting to build or maintain in-house, and there is a whole new generation of PSS providers emerging. Numerous new entrants are taking a growing share of the PSS market (either airline by airline, or more frequently, component by component) but how can they disrupt a market full of “legacy” airline systems and standards? Are core inventory and reservations capability a commodity? And if so, what are the real differentiators? Is end-to-end customer experience too big and too critical a job to give to a vendor? And can any vendor out there actually deliver it? Have customer expectations evolved beyond with traditional airline IT can deliver? How much of digital transformation is actually technology – and how much is structure, business process and employee culture? To what extent are APIs changing the distribution landscape and the way PSS are deployed and used within airlines? What is the future of pricing? As everything becomes more dynamic and API based does it really mean the end of booking classes (RBDs) and ATPCO fares, or will interoperability mean the industry has to work at the pace of the slowest mover? 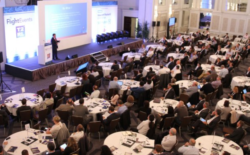 There will be speakers from American Airlines, Southwest, easyJet, Air Canada, Air France, Gulf Air, Hawaiian, El Al, Swiss, Fast Jet, Fly Dubai, T2RL, DXC, Datalex, Amadeus, Farelogix and IATA. Please let me know if you are going and we’ll try and meet up! Note 1: These numbers are based on my rather haphazard interpretation of the T2RL data – PSS contracts as they stand today but with last year’s passenger data for example. To get a more detailed view of the airline IT market look at T2RL.net.